In a recent article, tax implications for covered call writing was discussed. In this publication I will highlight the tax ramifications as they apply to selling put options. A capital gain is an increase in the value of as capital asset, such as a stock or an option that gives it a higher worth than the purchase price. Capital gains must be claimed on income taxes in non-sheltered accounts. 1- An expired option (we sold the put, we didn’t close the position by buying back the option, and the holder did not exercise the option) results in a short-term capital gain. For example, we sell a BCI April $90 put for $4.50 in March. The proceeds are $450. Since the cost is $0, the short-term capital gain is $450. The acquisition date will be LATER than the sales date and the word “Expired” should be written in column e, the cost basis column of Form 8949. 2- If we buy back the same option in the above example to close the position (usually to initiate an exit strategy), the difference between the sale profit and the buyback cost will represent a capital gain or a capital loss. As in example 1, above, the acquisition date will be LATER than the sales date. Capital gain example: We close our position by buying back the option for $250. The capital gain is $200 ($450 – $250). Capital loss example: We close our position by buying back the option for $550. The capital loss is $100 ($550 – $450). 3- If the option is exercised, the option transaction becomes part of the stock transaction. The option premium is subtracted from the price you paid for the stock, reducing your basis. Example: You sold the BCI April $90 put for $4.50. The put is exercised and you pay $90 per share for the stock. Normally, your cost basis would be $90. However, you received $4.50 per share for the put premium. This reduces your cost basis in the acquired shares to $85.50 ($90-$4.50). There is no gain or loss to report on the option trade. When you sell the BCI shares you will simply enter $85.50 in the cost basis column. The holding period of the shares from the exercise date until the sale date will determine if the transaction is long or short term. The holding period of the option is ignored. ***The Schedule D of the Elite Calculator is designed to assist your tax advisor with these long and short-term capital gains (losses) issues. The specific information referenced above can be found in IRS Publication 550 entitled Investment Income and Expenses, pages 59 – 61. Personally, I choose to avoid these tax issues by trading options predominantly in tax-sheltered accounts. For the week, the S&P 500 rose by 2.7% for a year to date return of 2.9%, including dividends. BCI: Cautiously bullish using an equal number of in-the-money and out-of-the-money strikes. I am linclined to be more conservative until we can view the market reaction to the first interest rate increase. I just wanted to say thanks for coming down to Florida for your covered call writing seminar. 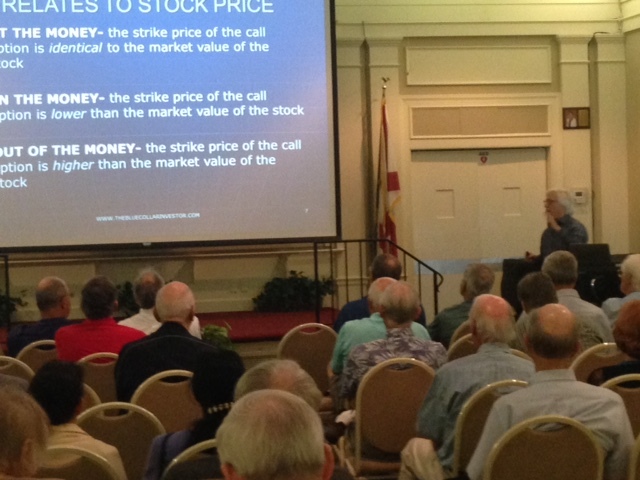 I live in Winter Park and really enjoyed your presentation (front row, blue shirt). I had a question on the website. Do you put up covered call candidates for the upcoming month ? Also, I wanted to ask if you are incorporating RRG charts (stockcharts.com) in your technical analysis of underlying stocks. Again, great job on the seminar! Thanks for the positive feedback and for attending the presentation. For our premium members we update the watch list of eligible stocks and ETFs weekly. The reason we publish the two reports weekly rather than monthly is that if an exit strategy is executed and a replacement security is needed, our members will have the most up-to-date information. The technical parameters we use in our BCI methodology are exponential moving averages, MACD histogram, stochastic oscillator and volume. We do not use relative rotation graphs in our analysis but have always encouraged members to use additional parameters or to replace the ones I’ve had success with to meet their investment strategy goals. At its annual shareholders meeting last week, Starbucks CEO announced a 2-for-1 stock split (its 6th split) payable on April 8th. For those who hold this security, the number of shares owned will double and the price-per-share will be cut in half leaving the market capitalization exactly the same. There is a positive psychological aspect to a stock split leaving share owners excited and bullish about the company although there has been no financial change. It is a plus in that it will make it easier for retail investors to purchase SBUX in round lots (100 shares at a time) because the price is halved. Options are also impacted in that if we sold two $100 calls, it will change to four $50 calls after the split takes place. 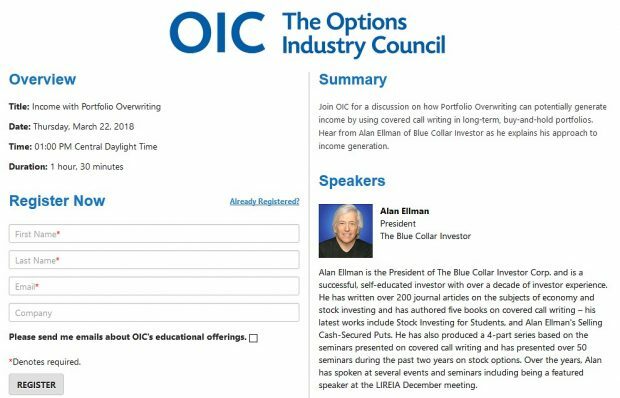 The OCC makes sure that all buyers and sellers of options are “made whole” after a contract adjustment. The Weekly Report for 03/20/15 has been uploaded to the Premium Member website and is available for download. Thank you for coming down and speaking to us about the BCI system. We enjoyed the talk and also to meet you in person. We will work on improving our knowledge of your system. And I am sure we will be in touch whenever we have questions. Actually I do have a question. Once a covered call strategy is executed say for a 3% premium and then one finds the underlying stock is taking off what should one do. Because this means the seller is loosing his premium. Should the call be repurchased say once the premium is down by 30 or 50%? And then start all over again? We enjoyed our visit to central Florida and appreciated the hospitality given to us by club members. If a stock moves higher significantly, option value will also move up. We keep the premium originally sold no matter what. If share price remains above the strike sold at expiration, we have maxed our trade potential and will decide on rolling the option or allowing assignment. If share price declines, causing the option value to decline, we use our 20%/10% guidelines. All this is detailed with examples in the books and DVDs you have. There was a typo for MTSI in the 3/20/15 report. The stock does not have any options and can’t be used for covered call or cash secured put trades. Thank you Bill R. for the catch. QRVO provides technology and radio frequency solutions for mobile, infrastructure and aerospace/defense. It’s forward PE is 24.1 a bit above industry average of 20.3 but we need to wait for additional reports as a combined company to make a more accurate assessment of value. Our Premium Stock Report shows an industry rank of “A” (chips), a beta of 1.86, adequate open interest for near-the-money strikes and a projected earnings report date of 4-29-15. What will happen to the option if the exchange halts in the underlying stock? For example, assume I have 500 shares of XYZ stock which I STO 5 calls. If the stock trading is halted at $50.00 for any reason and it is expiration Friday, what becomes of the covered calls? When trading is halted on a security, all trading on the options also cease until trading is resumed. At expiration, the option holder has the right to exercise at the “last available price” but we, as option sellers, cannot buy back the option. Hi. There’s a lot of talk these days (e.g. CNBC) about the “frothiness” of the US stock market. Lots of folks seem to think that US stocks are “fully valued” or more, and are looking at overseas markets for better potential growth. I was wondering whether/how the stock screening process in the Premium Report takes International stocks into account. Are they optionable in the first place? Do we have the right data to evaluate them with etc.? There are many international corporations that trade on the major US exchanges and many of them do have options associated with them. These stocks are known as ADRs (American Depository Receipts). In our BCI screening process, these companies are screened in the same rigorous manner as US companies, many of which have an international exposure as well. To be listed on our major exchanges like the NYSE, ADRs have a myriad of requirements which are designed to protect us, the investors. In evaluating listing eligibility, the Exchange considers qualitative factors such as the nature of a company’s business, market for its products, reputation of its management, historical record and pattern of growth, financial integrity, demonstrated earnings power and future outlook. The Exchange also considers the laws, customs and practices of the applicant’s country of domicile regarding matters such as the election and composition of the board of directors, issuance of quarterly earnings statements, shareholder approval requirements and quorum requirements. The NYSE MKT requires listed companies to obtain shareholder approval for certain corporate actions that would result in discounted stock and/or option issuances as well as other potentially dilutive transactions. As far as the gurus on CNBC: I’m always concerned about blanket statements regarding ALL securities in a market that has thousands of candidates. Our job, as Blue Collar Investors, is to locate the best candidates that will enhance the opportunity for outstanding returns. Most will come from US companies, some international. Hello! I’m New to options trading and have watched some of your videos. I learned a lot but I confused on one step that I was hopefully you could clarify. You mentioned if you have a stock that you like and want to keep, you can buy back the option. If I own 100 shares of XYZ and its trading at $60 and I do a covered call writing for $62 and the stock goes to $64, wouldn’t the option buyer exercise the option? If he exercises, then the stock goes to him. How do I buy back the option and keep the stock? 99.9% + of the time, an option will not be exercised (our shares sold) until after expiration (4 PM ET on the 3rd Friday of the month). This is because the option buyer will generate more cash by selling the option rather than exercising it and selling the stock. We can avoid exercise by buying back the option prior to 4 PM that day or earlier. Once we buy back the option we no longer have an option obligation and still own the shares. If the option buyer decides to exercise after we buy back our options, it will not be our shares that are sold to that person. Question about downside protection: can I place a stop loss order on underlying stock against which there there is an active and open covered call? I’m just concerned about the remote prospect of a catastrophic drop in the price of the underlying stock that exceeds the limited downside protection of an in-the- money call. If not, what about this technique called a collar? Are there circumstances where it would make sense? Thanks for any feedback. You ask an important question. It would be a mistake to close your long stock position before closing the short option position because that would leave you in a very risky naked option situation. Most brokerages will not allow retail investors to do so because of the liability they(the brokers) would be subjected to. As an alternative, set up some sort of alert to buy back the call option first. In the BCI methodology we use the 20%/10% guidelines. Once closed, the stock can be sold or another option written (roll down perhaps). Buying a protective put (collar) is a way of avoiding catastrophic declines in share price. It is appropriate for some as returns will decrease because of the option expense but may assist certain investors to sleep better at night.